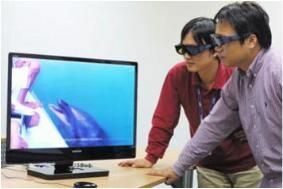 KOREA/JAPAN: Samsung shows OLED display for fatigue-free 3D | What Hi-Fi? And along with its 3.9mm-thick LED-lit LCD panel, which we covered the other day, the Korean company is showing a 2.5mm-thick 30in AMOLED (active matrix organic light-emitting diode) display. This is not just capable of a 1000000:1 contrast ratio, but is also claimed to produce 3D images without some of the dizzying effect Samsung says is common with other 3D 'screen and active shutter' systems. The Japanese companies have gone a bit quiet on Organic LED TVs after a burst of enthusiasm last year – there wasn't a sign of Sony's production OLED model on its stand at the recent CEATEC Japan 2009 show, let alone any new prototype models – but it seems their Korean rivals haven't been standing still. So the new 240Hz screen not only uses Samsung's fast Simultaneous Emission with Active Voltage system, and also allows a degree of crosstalk between the alternating left and right eye images, relying on the polarised glasses with which the screen is designed to be used to sort out the 3D image. Samsung says this avoids the dizziness and fatigue possible when viewing with the glasses used in other 3D systems – and here of course it means those used by its Japanese rivals. Check out our December issue, on sale November 13, for our 3D special, with all you need to know about the shape of TV to come.